If your dentist has taken x-rays, you may request that they forward them to our office. If additional x-rays are necessary, they can be taken at our office. There's nothing to fear with a dental exam. Your teeth will be visually examined for signs of plaque, tartar and tooth decay. Your gums will also be examined for puffiness or discoloration, which are signs of gum disease. A thorough head , neck and oral cancer screening is also done to properly diagnose and prevent any future problems. A full set of dental X-rays will enable your dentist to see below the surfaces of your teeth. 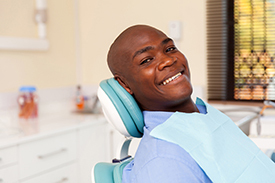 Dental exams typically end with a dental prophylaxis or cleaning. No matter how often you brush and floss, plaque and tartar deposits can still build up on your teeth. A professional teeth cleaning is the single most effective way to remove these deposits and prevent them from causing more serious problems in the future. An ultrasonic cleaning is a popular alternative to traditional teeth cleanings. With an ultrasonic teeth cleaning, an ultrasonic scaler is used to remove deposits, kill harmful microbes and eliminate bacteria around the teeth and gums through high-frequency sound waves. Many patients find an ultrasonic teeth cleanings more comfortable than traditional teeth cleanings because they are more thorough, quicker, quieter and in most cases, pain-free.